If you want to know why Northern California’s avian population went nuts in The Birds, or how The Wizard of Oz was able to send Dorothy home to Kansas despite being a fraudulent huckster, then this is the film for you. A collaboration between Slovenian philosopher, psychoanalyst and film buff Slavoj Zizek and English documentary filmmaker Sophie Fiennes, The Pervert’s Guide is an illuminating, thought-provoking and very entertaining three-part Freudian examination of classic and contemporary Western cinema. The ideas are culled from Zizek’s published writings on cinema (which he calls ‘the ultimate pervert’s art [because] it tells you how to desire’), and here they’re illustrated with film clips chosen by Fiennes. 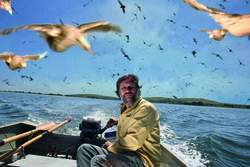 The eccentric and charismatic Zizek presents his theories himself, and his manic enthusiasm and earthy scatological humour is constantly charming, frequently funny and never dryly academic. Enjoyable enough as these dialogues are, Fiennes gives them a marvellous cinematic twist by recreating scenes from the films and placing Zizek in them.